In einem Forschungsvorhaben zur "Fiskalischen Dezentralisierung im Sudan am Beispiel des Bundesstaates Al Gadarif" wird in den kommenden Monaten (Juni bis September 2014) von einem Gastwissenschaftler aus dem Sudan, Sharif Ismail M. Bongo von der University of Gadarif, untersucht werden, welche Möglichkeiten es gibt, die vertikalen und horizontalen fiskalischen Ungleichgewichte im föderalen System des Sudan zu reduzieren. Sowohl die vertikalen Ungleichgewichte in der Finanzausstattung (zwischen der föderalen Regierung in Khartum, dem Staat Al Gadarif und den lokalen Verwaltungseinheiten des Staates) als auch die horizontalen Ungleichgewichte in der Finanzausstattung (zwischen den siebzehn Bundesstaaten des Sudan und zwischen den zwölf Provinzen des Staates Al Gadarif) werden in diesem Forschungsvorhaben untersucht. Diese Ungleichgewichte sind in höchstem Masse entwicklungshemmend und führen zu Konflikten zwischen den Bevölkerungsgruppen und zwischen den Teilstaaten und Verwaltungseinheiten. Der Aufenthalt des Gastwissenschaftlers an der Universität Bremen wird vom DAAD finanziert; die Betreuung und Beratung hat Professor Dr. Karl Wohlmuth übernommen, der seit den 80er Jahren Stipendiaten aus dem Sudan berät. Im Rahmen des viermonatigen Forschungsaufenthaltes werden von Herrn Sharif auch Vorträge und Seminare zu dem Thema abgehalten. Ein Bericht für die Sudan-Studienreihe SERG Discussion Papers Nummer 42 (Link: http://www.iwim.uni-bremen.de/publikationen/pub-sudan.htm ) ist zum Thema "Fiscal Decentralization in Gadarif State: Did it Realize the Promise?" in Vorbereitung. Herr Sharif hat kürzlich bei der 4th Annual Conference on "Structural Reform, Transformation, and Sustainable Development in Post-Secession Sudan: Economic, Political, and Social Perspectives" zum Thema "Restructuring Intergovernmental Fiscal Relations to Enhance Growth and Development in Post-Secession Sudan" vorgetragen. Auch bei der vorhergehenden 3. Konferenz hat Herr Sharif einen Vortrag gehalten. Diese Konferenzen werden organisiert von der Faculty of Economic and Social Studies, University of Khartoum, dem Sudan Ministry of Finance and National Economy und der World Bank. Die Konferenz (April 21 - 22, 2014, Conference Venue: Shariqa Hall, University of Khartoum) wird jeweils auch mit einem Ergebnisbericht abgeschlossen, der für die Politikreform im Sudan wichtig ist (vgl. zur Konferenz Programme and Call for Papers in englischer und arabischer Sprache, mit den Links http://www.iwim.uni-bremen.de/Siakeu/Conference%20Theme%202014_Eng.pdf und http://www.iwim.uni-bremen.de/Siakeu/Conference%20Theme%202014_Ara.pdf ). Der Ergebnisbericht der 3rd Annual Conference mit den Empfehlungen für die Politik liegt in englischer und arabischer Sprache vor (Link: http://www.iwim.uni-bremen.de/Siakeu/FESS_Annual%20Conference%20Booklet%202013.pdf). Im Rahmen der Sudan-/Südsudan-Forschung in Bremen stehen Themen der Implementierung nachhaltiger Wirtschaftsreformen im Vordergrund (vgl. den Kurzbericht von Professor Wohlmuth mit dem Link: http://www.iwim.uni-bremen.de/Siakeu/Nachhaltige_Wirtschaftsreformen_im_Sudan.pdf und die aktuelle Studie für die SERG-Reihe mit dem Link http://www.iwim.uni-bremen.de/Siakeu/Wohlmuth-SERG-41.pdf ). In Volume 17 of the African Development Perspectives Yearbook with the title Macroeconomic Policy Formation in Africa – Country Cases the Editors took up the event of the Independence of the Republic of South Sudan on July 9, 2011 and the recent developments which have occurred since in Sudan and in South Sudan and between these two countries to publish a special Unit as part of the Yearbook. This Unit 1 on New Economic Policies for Sudan and South Sudan - The Need for a Strategic Economic Cooperation has three chapters and highlights the need for new macroeconomic strategies and policies in Sudan and South Sudan embedded in a new political environment; there is also a focus on the many political and economic interdependencies between these two countries, especially in the border areas between Sudan and South Sudan. The Editors were enthusiastically supported in this endeavor by research groups from the two countries. The authors of this Unit 1 are convinced that new macroeconomic policies (supported by medium-term and long-term development strategies) and a strategic economic and political co-operation between the two countries (based on visions of sustainable growth in the border areas) are necessary. So far, the political processes and the attitudes of the elites in these two countries show that the lessons from the many decades of conflict between and within these two countries were not learned. 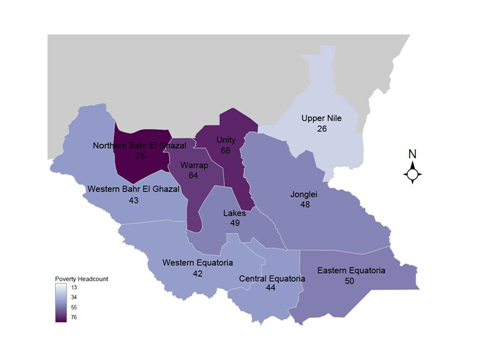 The civil war inside the South Sudan since December 2013 and the continuing conflicts in major regions of Sudan make millions of people in both countries suffering. While the data from the most recent National Baseline Household Survey of 2009 revealed high levels of poverty in both countries (see Graph 1 and Graph 2), it can be expected that income poverty and other dimensions of poverty in both countries have further worsened in the last years. Volume 17 of the African Development Perspectives Yearbook contains as well a Unit 2 on Macroeconomic Policies in West Africa. Researchers from academic institutions in Nigeria and Senegal, and from WAMA (West African Monetary Agency) and WAMI (West African Monetary Institute) have contributed to this important Unit with four chapters. In order to compare and to contrast the established CFA-based WAEMU (West African Economic and Monetary Union) integration process with the newly established WAMZ (West African Monetary Zone) integration process, Senegal was included as a country case for the CFA Zone. In Unit 3 of Volume 17 a great number of book reviews and book notes is presented and so this Unit 3 is a valuable source of information on new books, journal issues, documents and research papers with a focus on macroeconomic policy formation in Africa. Volume 17 is complementary to Volume 16 on Macroeconomic Policy Formation in Africa – General Issues which was published already in 2013. Because of the great number of high-quality submissions of papers for Volume 18 on Africa’s Progress in Regional and Global Economic Integration the International Call for Papers for this volume is closed now (but submissions of papers on successfully and competitively exporting African companies and on global and regional value chains led by African firms are still accepted). Die neue Studie von Professor Karl Wohlmuth über umfassende und nachhaltige Wirtschaftsreformen im Sudan und im Süd-Sudan ist soeben in der Reihe SERG (Sudan Economy Research Group) Discussion Papers erschienen (vgl. den Link zu den SERG Discussion Papers). 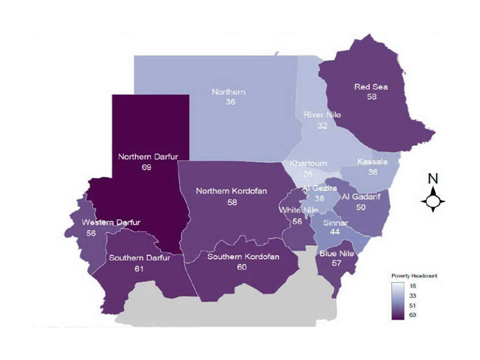 The new study by Professor Karl Wohlmuth about comprehensive and sustainable economic reforms in Sudan and South Sudan has just been published in the SERG (Sudan Economy Research Group) Discussion Paper Series (see the link to the SERG Discussion Papers). Welche Politiken führen aus den politischen, sozialen und ökonomischen Krisen heraus? A great event for the postdoctoral fellows who are supported by the VolkswagenStiftung. 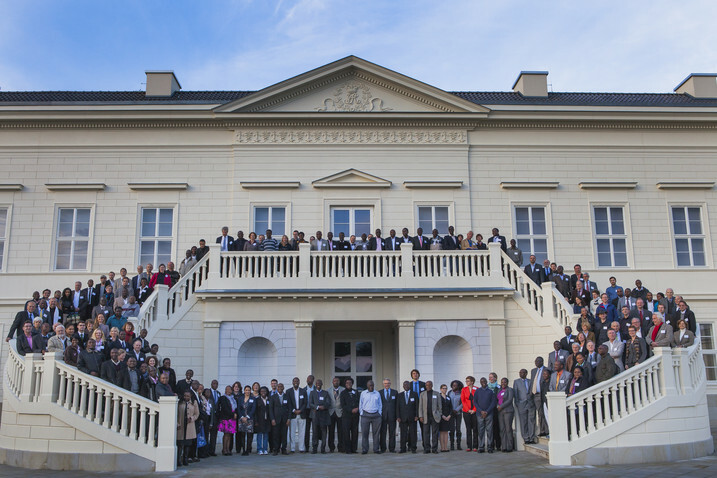 180 junior researchers, representatives from African Universities and African Research Organizations and experts on African development met at the rebuilt Conference Center of the Herrenhausen Palace in Hanover. The VolkswagenStiftung started its Africa Initiative early in 2003 and so celebrated with this event in Hanover also 10 years of support for African researchers who work in cooperation with German research partners and their respective institutions. While in earlier years (2003 - 2008) research projects and fellowships were granted for research projects with graduate and doctoral students, since 2008 the VolkswagenStiftung is funding a programme for postdoctoral students. At the Conference in Hanover the junior researchers presented their projects – in lectures, presentations and poster sessions. A broad spectrum of research issues was made visible. Research programmes and fellowships were financed for the subjects Natural Resources, Livelihood Management, Social Sciences, Humanities, Engineering Sciences, and Neglected Tropical Diseases. Among the African countries with a greater number of funded postdoctoral fellows were Ethiopia, Uganda, Kenya, Tanzani, South Africa, Ivory Coast, Cameroon, Chad, Ghana, Nigeria, Zimbabwe, Sudan and Burkina Faso. Professor Karl Wohlmuth from the University of Bremen was invited as an expert on African Development. He was involved in a research project of the VolkswagenStiftung as director and cooperation partner for the project “Governance and Social Action in Sudan after the Comprehensive Peace Agreement of January 9, 2005”, a project which started in 2005 and ended in 2012 (see Governance Project Link: http://www.iwim.uni-bremen.de/africa/Sudan.Drittmittel/Governance_bak.htm). Professor Karl Wohlmuth from the University of Bremen and UNMISS (United Nations Mission in the Republic of South Sudan) have agreed to cooperate in assessing the situation with regard of peace, security and development in South Sudan. UNMISS has a mandate since 9 July 2011 to consolidate peace and security and to establish conditions for development (see the link to UNMISS: http://www.un.org/en/peacekeeping/missions/unmiss/). Professor Karl Wohlmuth and a representative from UNMISS have recently agreed in Bremen to exchange information and to assess the situation in South Sudan. Professor Wohlmuth works since 1978 on development in Sudan, researching on economic development and the political economy of Sudan. Since 2005 the professor researches on the implications of the Comprehensive Peace Agreement (CPA) between the North and the South, and since 2011 he works about the modalities of a strategic cooperation between Sudan and South Sudan (see the link: Sudan Economy Research Group/SERG and the project Economic Policies in Sudan after the Referendum of 2011). Recently a documentary film by ARTE has shown the tremendous difficulties to establish the foundations for a viable state of South Sudan (see the link to the film by ARTE: http://www.arte.tv/guide/de/045315-000/suedsudan-geburt-eines-staates#details-photos, and see also the Documentary Film "South Sudan - Birth of a State"). Any progress will depend on a strategic cooperation between Sudan and South Sudan as the border region between the two countries is so important for peace, security, growth and development in both countries. This is the title of Unit Three for the forthcoming volume of the African Development Perspectives Yearbook with the title "Macroeconomic Policy Formation in Africa". The Editors of the Yearbook took the event of South Sudan's Independence on July 9, 2011 as an obligation to plan for a whole Unit on the Sudan and the South Sudan for the new volume of the Yearbook. As the separation of the South is of tremendous importance not only for the two countries Sudan and South Sudan but also for the whole continent of Africa, the Editors have invited leading researchers from the University of Khartoum, the University of Kassala (both in the North) and the University of Juba (in the South) to write on the macroeconomic policies and the macroeconomic policy formation processes of the two countries. Dr. Dirk Hansohm, Macroeconomic Advisory Services Nairobi, Kenya, currently working as a consultant in Khartoum, a former member and collaborator of the Sudan Economy Research Group (SERG) at the University of Bremen, also has contributed to the Unit Three. While the essay on the Sudan considers the macroeconomic consequences of the secession of the South, based on an analysis of the major economic problems and shocks of Sudan since the 1970s, the essay on the South Sudan concentrates on establishing fiscal planning and building fiscal management as cornerstones of macroeconomic stability. Macroeconomic aspects of the two countries are considered by all the authors with having a longer run view in mind (see the Synopsis of the new volume of the African Development Perspectives Yearbook). The Unit Three is also a contribution to the understanding of the economics of post-conflict countries in Africa. It came out from the two papers that despite of quite different endowments and initial conditions the two countries have to pursue similar economic policies so as to strengthen the weak economic policy institutions, to redirect production and exports towards diversification, to lay the foundations for macroeconomic stability and fiscal decentralization, and to establish basic social policy systems. As well the huge defense sector in both countries has to be scaled down because of the fiscal burden and the diversion of resources from productive activities, especially agriculture and manufacturing. The abundant natural resources in the two countries could be used more fully by appropriate strategies. New economic strategies and macroeconomic policies have to be based fully on a medium to long-term planning approach, and growth and employment diagnostics approaches are recommended to enhance local development. Professor Karl Wohlmuth introduced the Unit with an essay on New Economic Policies for Sudan and South Sudan and the Need for a Strategic Economic Cooperation. Five elements of a new macroeconomic policy framework were outlined for the two countries, and the contours of a Border States Development Programme (BSDP) were discussed. Such a programme should guide the development of the now eleven states in the North and in the South along the international border between Sudan and South Sudan. This programme would allow it to develop the abundant natural resources in the area to the benefit of the people in both countries. Im Rahmen der Vortragsreihe "Vom Sudan nach Namibia", organisiert vom Rektorat und dem International Office der Universität Bremen in Verbindung mit Institutionen der Entwicklungszusammenarbeit in Bremen, hielt Professor Karl Wohlmuth einen Vortrag über "Sudan und Süd-Sudan: Vom Konflikt zur Kooperation?. Frau Prof. Dr. Yasemin Karakasoglu, Konrektorin für Interkulturalität und Internationalität, eröffnete den Vortragsabend. Der Professor ging zunächst auf die Phasen des Sudanprojektes an der Universität Bremen (Sudanforschungsgruppe Bremen) seit den 70er Jahren bis zur Gegenwart ein und analysierte dann die Ursachen der Konflikte zwischen dem Sudan und dem Süd-Sudan. Auf Möglichkeiten und Chancen einer zukünftigen Kooperation der beiden Länder wurde eingegangen. Im Vortrag wurden fünf Themen behandelt: Erstens, die Konflikte im Sudan: Ursachen, Einflussfaktoren, Perioden; zweitens, das sudanesische Wachstumsmodell und die Konflikte; drittens, die Geographie, Intensität und Dynamik der Konflikte im Sudan/Süd-Sudan; viertens, Ansätze für eine Lösung der Konflikte durch eine grundlegend neue Wirtschafts- und Sozialpolitik; und fünftens, Ansätze für eine Lösung der Konflikte durch eine strategische ökonomische Kooperation zwischen Sudan und Süd-Sudan. Eine lebhafte Diskussion über die Thesen des Bremer Sudanforschers schloss sich an den Vortrag an. Die Präsentation wird auf Grund des bekundeten Interesses nun einer breiteren Öffentlichkeit zugänglich gemacht (Link: PDF Präsentation). Ein Draft Paper zum Vortrag und Aufsätze des Referenten zu den behandelten Themen liegen vor (vgl. Publikationen von Karl Wohlmuth). Über diese Themen wird im Rahmen der Sudanforschungsgruppe der Universität Bremen in den kommenden Jahren weiter gearbeitet (Link: Sudanforschungsgruppe). Die Universität Bremen dokumentiert ihre Zusammenarbeit mit afrikanischen universitären Partnern im Rahmen von Ausstellungen und einer Vortragsreihe vom 30. April  28. Mai 2013 im DGB-Haus am Hauptbahnhof (vgl. den Flyer zu der Veranstaltung: http://www.uni-bremen.de/fileadmin/user_upload/international/Aktuelles/IO_Vom_Sudan_nach_Namibia_Flyer_20130318_RZ.pdf ). Sowohl die Kooperation von Wissenschaftlern der Universität Bremen mit Namibia als auch jene mit dem Sudan währt nun schon über 35 Jahre. In der Zwischenzeit sind zahlreiche weitere Kooperationen mit Afrika dazugekommen und prägen Lehre und Forschung der Exzellenzuniversität. Professor Karl Wohlmuth wird am 28. Mai 2013 zum Thema "Sudan und Süd-Sudan: Vom Konflikt zur Kooperation" einen Vortrag halten (vgl. Synopse unter: http://www.uni-bremen.de/international/profil-international/aktuelles-und-berichte/aktuelles/vom-sudan-nach-namibia.html). Berichtet wird über die Projekte der Zusammenarbeit mit dem Sudan und über die aktuellen Forschungen zu den Entwicklungen nach der Unabhängigkeitserklärung des Süd-Sudan vom 9. Juli 2011 (vgl. dazu ausführlich: http://www.iwim.uni-bremen.de/EconomicPoliciesInSudan.htm und http://www.iwim.uni-bremen.de/forschung/forsch-sudan.htm ). Die Veranstaltung wird am 30. April 2013 von Frau Prof. Dr. Yasemin Karakasoglu, Konrektorin für Interkulturalität und Internationalität, und von S. E. Neville Gertze, Botschafter der Republik Namibia, feierlich eröffnet. Prof. Dr. Manfred Hinz hält den Eröffnungsvortrag.